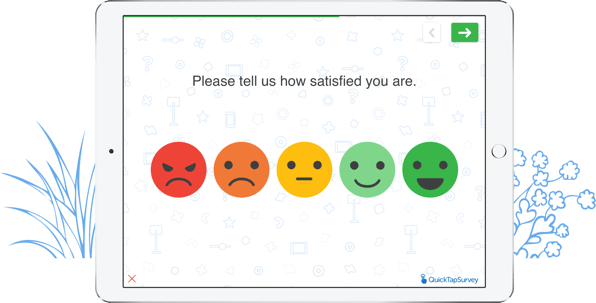 Take your customer service to the next level with QuickTapSurvey's intuitive mobile feedback surveys. No internet needed! Let guests easily complete a restaurant survey form from the comfort of their mobile device or tablet. QuickTapSurvey works on all iOS and Android devices. Have spotty internet? No problem! Our restaurant survey app works offline seamlessly so you can continue capturing feedback data without missing a beat. Create beautiful surveys in minutes that match your restaurant's branding. Add your logo, include your brand colors, change backgrounds, and much more. Customize the way you collect feedback through a variety of field types, including email capture, telephone number, sliding scales, star ratings, and text input. The little things matter. Thank customers and guests for completing your restaurant feedback survey with a personalized email as soon as they click submit. Transform tablets into kiosks to collect feedback at tables or checkout. Your surveys will loop automatically and send alerts if there are issues with performance. Have tables or restrooms that aren't being cleaned properly? View feedback as soon as it's submitted so you can take immediate action and improve your services. Keep tabs on your customer feedback with daily, weekly, and monthly satisfaction reports that you can easily share with your staff members and executive team. Ensure negative feedback gets addressed immediately by sending out instant email notifications to employees and managers as soon as a survey is submitted. Owner, Evolution Food Co. Inc.
Say goodbye to paperwork and manual data entry. With our restaurant survey app, you can connect your surveys to hundreds of applications like Zapier, Salesforce, and MailChimp. Easily add customer emails to your email platform, update your CRM with new details, organize feedback data in your G Suite, and much more. Improve your restaurant from top to bottom. See what guests think of your food, and collect ideas for new menu items. Ensure customer needs are met quickly and issues are handled appropriately. Gauge whether customers feel welcome and comfortable in your restaurant. Easily create your own restaurant survey form from scratch or customize one of our pre-built templates to get started. Delight your customers with excellent service. See QuickTapSurvey's restaurant survey app in action by starting a free trial. No credit card required.